Dictionary ProjectHome » News » Book. Gasm! And new project. Book. Gasm! And new project. Heads up: This post is long and image-heavy. Each year, The Writer’s Studio at Simon Fraser University publishes an anthology of that year’s students’ work. The anthology is called emerge (this year’s is emerge 14) and students are involved in every aspect of its production, launch, and sales. The launch party has to be self-financing, so we had a fund-raising party on the weekend. Most of the money raised came from a silent auction. One of the program’s writing mentors donated three lots of vintage books to the auction. I got one lot, at an absolute steal. 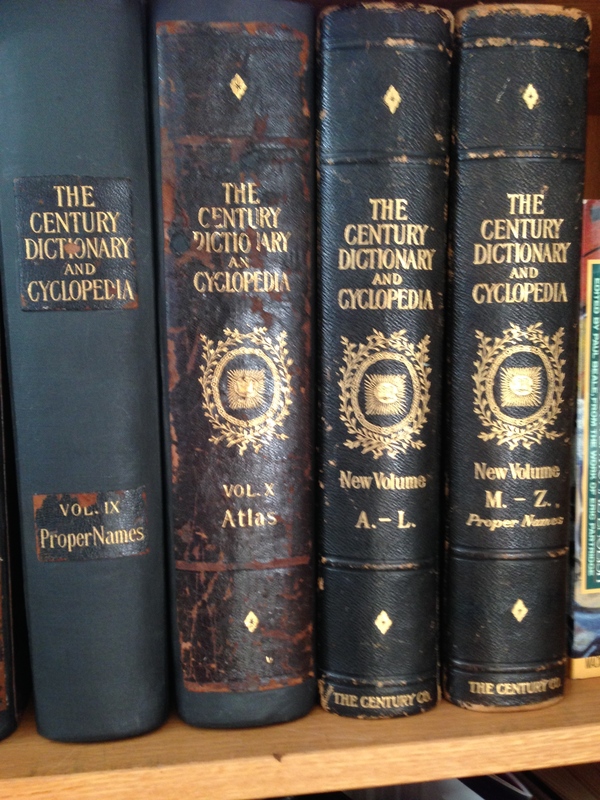 Say hello to The Century Dictionary and Cyclopedia: a work of universal reference in all departments of knowledge, with a new atlas of the world, originally published by The Century Co. of New York in 1889. This ten-volume edition was printed in 1901. 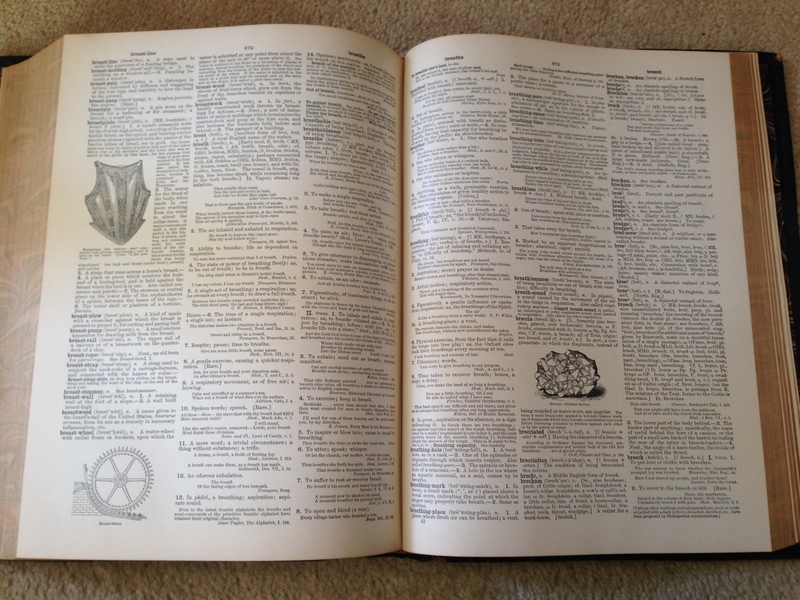 The first eight volumes contain words, from A-Z. Volume IX is entirely devoted to Proper Names. Volume X is an Atlas! 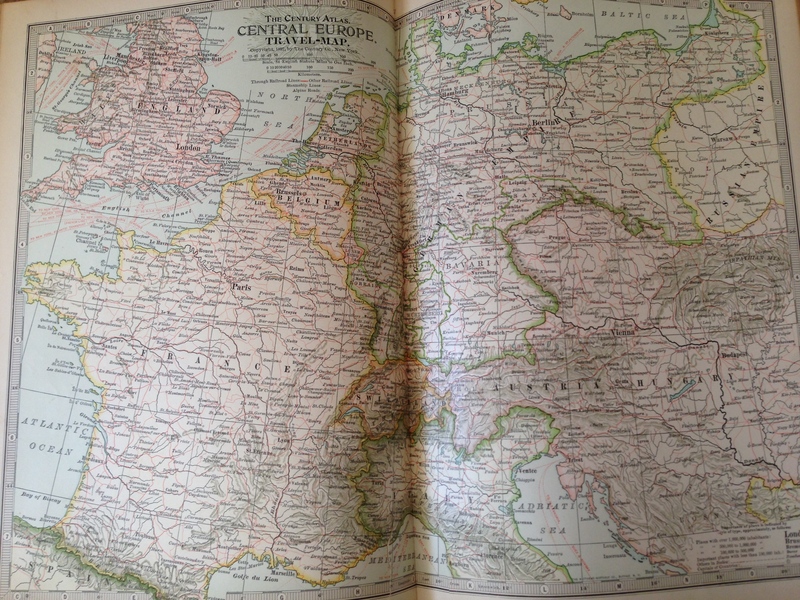 Hundred-year old maps of the world! I may have hyperventilated a little. And then there are the “new volumes”, XI and XII. A great many words and proper names were added to the language in the early 20th century, as scientific discovery and development moved in leaps and bounds. 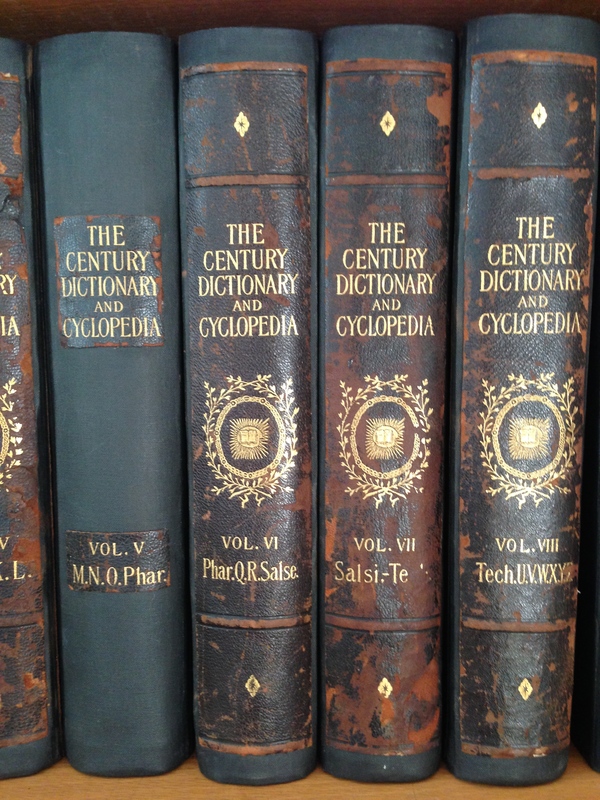 With the publication of the Atlas which is incorporated in the present edition The Century Dictionary and Cyclopedia has been brought to completion. As the Cyclopedia of Names grew out of the Dictionary and supplemented it on its encyclopedic side, so the Atlas has grown out of the Cyclopedia and serves as an extension of its geographical material. Each of these works deals with a different part of the great field of words,–common words and names–, while the three, in their unity, constitute a work of reference which practically covers the whole of that field. The total number of words and names defined or otherwise described in the complete work is about 450,000. The entirety of the language, in four hundred and fifty thousand words! A hundred-odd years on, and our language has grown almost exponentially, and one modern estimate places the current word count at 1,025,109.8. (How do you get 0.8 of a word? Leave the ‘u’ out of ‘colour’?) That’s the highest estimate I found, and it may be artificially inflated; according to oxforddictionaries.com, the Second Edition of the 20-volume Oxford English Dictionary contains full entries for 171,476 words in current use, and 47,156 obsolete words. 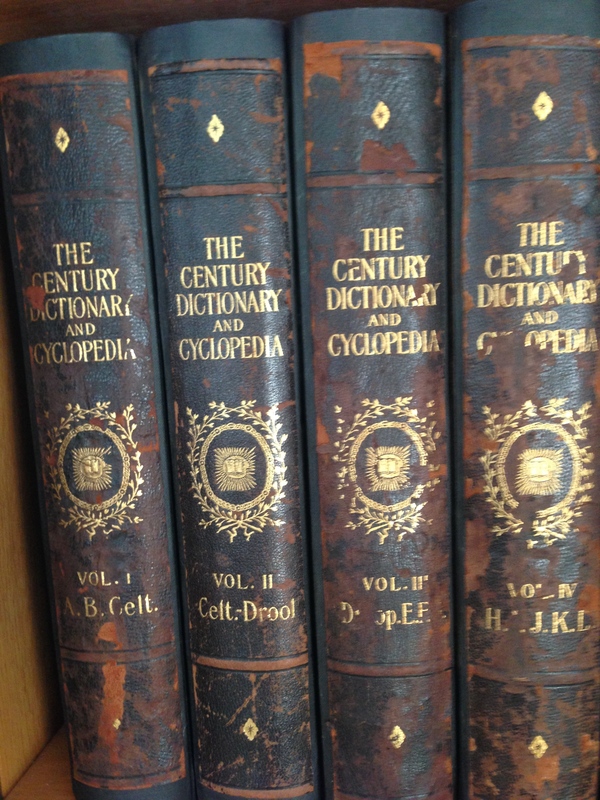 How did these Yale lexicographers manage to fit 450,000 words and names into the original ten volumes, if it now takes the OED twenty volumes to define or describe fewer than half that many? Some investigation is required. These lovely cloth-and-leather bound volumes have been well cared for in their previous home, but when you’re over a hundred years old, age is going to show a little. The leather on spines and covers still smells like leather, even where it’s cracked and peeling, or the gilding of the volume identifiers has chipped. There is no evidence of water damage, and very little damage overall. The pages are unwrinkled, and are cool and slightly leathery on the nose. These books were printed on high-quality mellow ivory paper; both paper and ink have aged well. 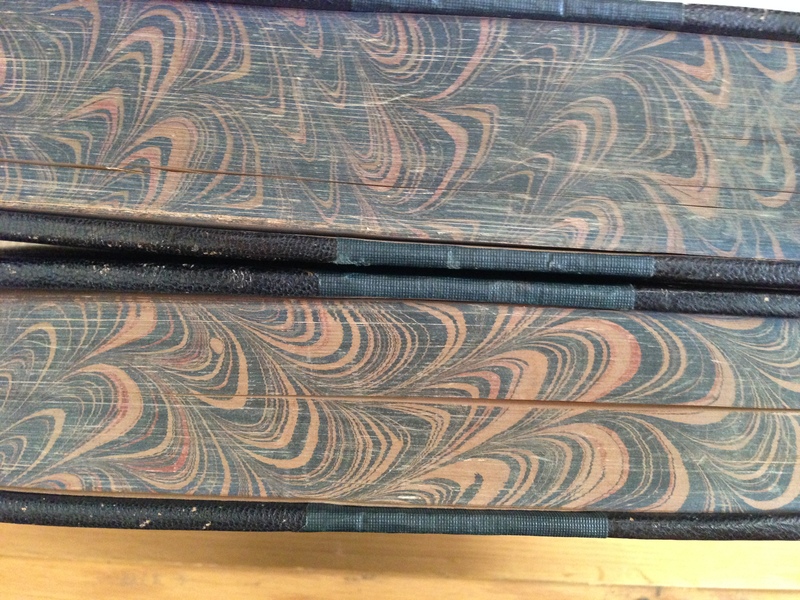 Volumes V and IX have undergone repairs, and most of the original leather spine is gone. The Atlas, obviously much-used, has also been repaired, but not before its front cover cracked, and its original end-paper, front matter, and all but one page of the Table of Contents were lost. 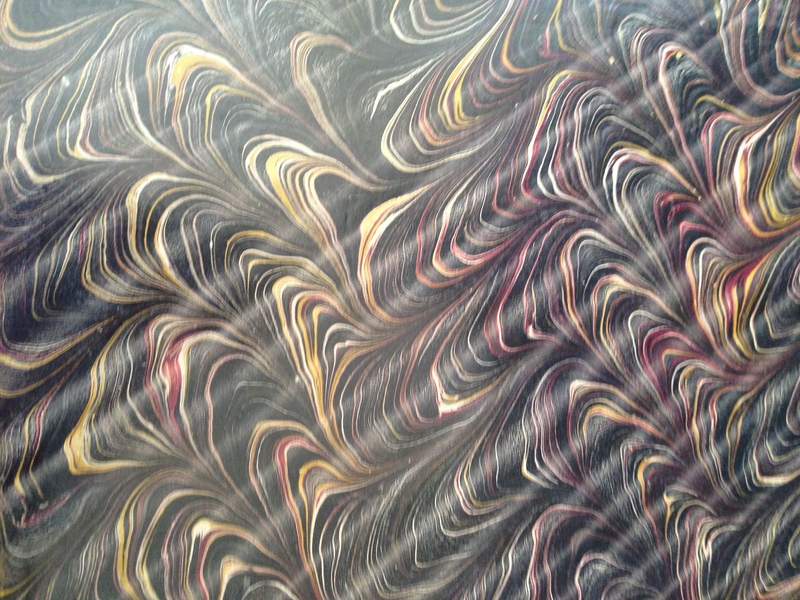 Speaking of end-papers, how about this for gorgeous? Those diagonal lines aren’t wrinkles, they’re visual effect. This page is perfectly flat. Even more delightfully, the end-paper design continues on the book edges. Even on the two volumes that were printed nine years later than the others. It’s got pictures in it! When I was a kid, we had a dictionary that had drawings and diagrams in it, but I haven’t seen many such since. I might have jumped up and down a little. Austria-Hungary! The Russian Empire! The German Empire! Prussia! The borders! I might have swooned a little. I can’t wait to have a better look — and a big long sniff — at this and all these glorious volumes. Which brings me to the ‘new project’ part of the title of this post. Books and knowledge are for sharing. And isn’t that what blogging is for: sharing knowledge? There are twelve volumes in the set; there are twelve months in a year. There are twenty-six letters of the alphabet; there are… more than twenty-six days in a month. Do you see where this is leading? Starting October 1, 2014, I’m going to share something from this hundred-year-old “work of universal reference in all departments of knowledge” every day. October being the tenth month, I will start with Volume X: The Atlas. For words and names, I’ll certainly go alphabetically from day 1 – day 26 (and perhaps leave days 27-31 as wild card days), but a different approach may be required for the atlas. I’ll see how it goes. Is there anything from the Atlas you’re particularly interested in seeing? Also, I need to check the internet to see if there’s anything I should do to keep these books, especially the bindings and spines and covers, in good nick. If you know anything about the care and feeding of old books, please weigh in!